In the last two decades the Worm Like Chain (WLC) model (Figure 2) is used to describe the behavior of flexible protein loops and the extension of DNA under force. It assumes the peptide chain (or DNA) as a semi-flexible tube with certain characteristics of which the persistence length (p of Lp) is the most important, it describes the chain spatial “memory” . 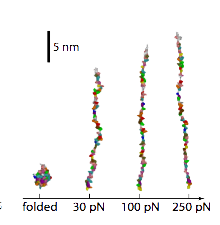 In a recent article in PNAS by Guillaume Stirnemanna, David Gigantib, Julio Fernandezb, and B. J. Bernea titled “Elasticity, structure, and relaxation of extended proteins under force” the famous ubiquitin protein (Figure 1) is virtually stretched to an extend of some painful nanometers. Their main conclusion is the WLC model is perfectly applicable to describe the extension of a protein under force. Furthermore it is not possible to distinct specific secondary structures when forces >30 pN are applied, but local interactions in the chain still play a role upon stretching. In their simulation they first fully extended ubiquitin in vacuum at 800 pN, added water and let it rest for some time at 250 pN. 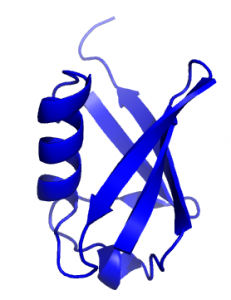 Then the unfolded protein was exposed to a collapse in force back to a variety of forces. This resulted in different extension profiles (Figure 3) in which no secondary structure is present. They conclude that for forces >30 pN the WLC can be used to describe the extension profile of ubiquitin and proteins in general. So the executioner now know precisely how far it can stretch it’s victims. With the current economic situation in mind, even the executions cannot be spared for meeting their monthly quotum. With the WLC in hand however they now can, without spending unnecessary force, precisely define the extension of their object. Another useful application of the WLC can be found in the field of thermodynamics; it can be used to describe the probability of a flexible protein linker in a particular conformation (more precisely end-to-end distance). More on that subject next time. 1. Stirnemann, G., Giganti, D., Fernandez, J. M. & Berne, B. J. Elasticity, structure, and relaxation of extended proteins under force. Proceedings of the National Academy of Sciences of the United States of America 110, (2013). 2. Zhou, H. Polymer Models of Protein Stability, Folding, and Interactions. Biochemistry 43, 8–15 (2004). 3. Bustamante, C., Marko, J., Siggia, E. & Smith, S. Entropic elasticity of lambda-phage DNA. Science 265, 1599–1600 (1994).